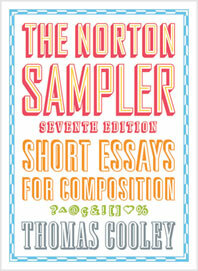 Fifty eight selections, half new to the book, and half composed in the last ten years, are beautifully written and on engaging topics—Obama’s inaugural speech, Garrison Keillor’s description of a day at the Iowa State Fair, Sean Carroll on Evo Devo, Dave Barry’s hilarious essay on the difference between guys and men, Marjorie Agosín on her life as a bilingual speaker and writer—and more. 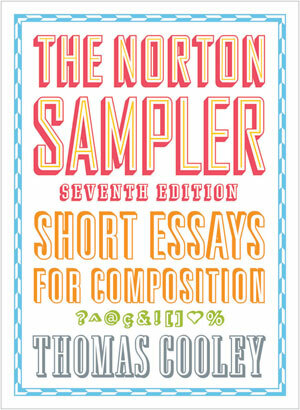 With an introductory chapter on reading and writing, brief writing guides and templates for getting started in each modes chapter, and a complete appendix on doing research, The Norton Sampler provides enough instruction that students will not need an additional rhetoric. Examples, including visuals, show how the rhetorical techniques taught in the book play an important role across media—on magazine covers and coffee mugs, billboards and websites—and demonstrate that these are methods students will use beyond the classroom. The Seventh Edition has templates that show basic, sentence-level moves students need to start writing in each rhetorical mode and glosses for cultural references students may not know. Readings are grouped on two current issues, the use of performance-enhancing drugs and the relationships between about language and identity. Each cluster includes four readings. With guidance on doing research and documenting sources using the 2009 MLA guidelines, along with a complete sample paper. This short-essays reader practices what it teaches about good writing.